A young man asked Jesus, “Who is my neighbor?” At St. Paul’s we seek to answer that question through our mission trips, connecting with people near and far. By expanding our definition of community, and seeing all whom we encounter as our neighbor, we are able to do God’s work in the world. We seek to form partnerships with those who are serving their communities, and to help them in their efforts. We believe all are called to serve their neighbors and we seek to provide opportunities for hands-on, relational encounters. We believe a good mission trip has three components: meaningful work, spiritual growth, and Christian fellowship. Since 2012, our youth have experienced this and more through our relationship with ministries in McDowell County, West Virginia. Lots of Opportunities to Get Involved for Youth! ​Remember How Much God Loves You! ​Starting Another Strong and Exciting YOUTH Season! 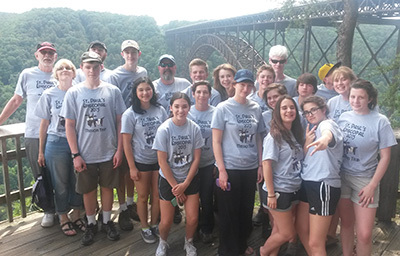 Hear from the St. Paul's Mission Team! It's Time for the St. Paul's Mission Trip! Mother's Day Treats and MT'17 Car Wash!